Purpose of EVA: To create a photo and video tribute to the international Winter Olympic Games in Pyeongchang, South Korea utilizing VR education and to connect our Artist in Residence’s Performing Astronautics work with our crew’s backup Commander Dr. Soyeon Yi, South Korean Astronaut. During the breakfast and EVA briefings, Dr. Pell prepared the crew with the design of the tasks including choreography, staging, camera set up, the sequence of required shots, and all equipment required on site. 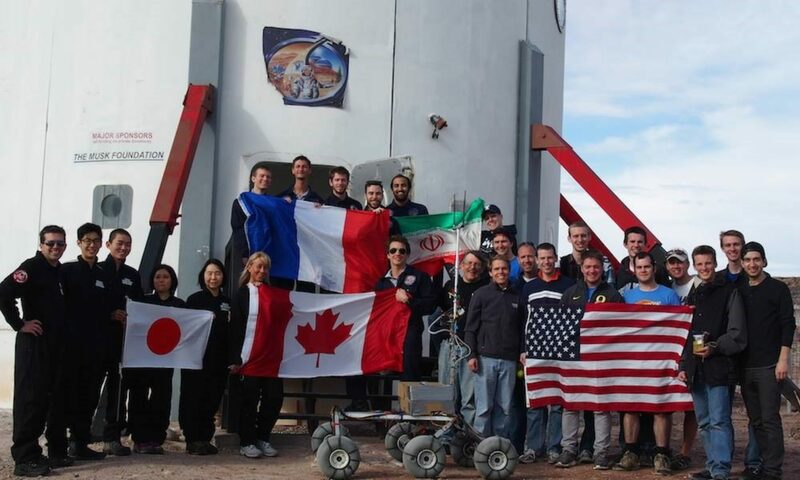 The Crew prepared themselves by taking photos with our national flags, and then Mars Flag, then playing an orchestral recording of the official Mars Anthem “Rise to Mars”. Mumbai, India-born opera singer Oscar Castellino, composed the uplifting score, with inspirational words co-written by Castellino and Mars Society President Dr. Robert Zubrin. As the EVA #12 team arrived at the Marble Ritual site, Pell initiated a series of challenges to inform research into Performing Astronautics. The team activities included the Insta360º Pro (a.k.a. Magpie) recording from 6 camera lenses in 4K 360 Pano. The crew performed to the camera, as it represented multiple vantages for the potential audience: as if they commanded an amphitheatre or arena, on Mars, and in direct live-stream via VR to Earth. The first task was to install a Martian “eternal flame”. After consultation with the public, José Cordeiro, Energy advisor to the Singularity University, suggested that we create a Solar Flame (of course). We achieved this by fashioning a silver survival blanket into the shape of a flaming plume and seated it aloft one of the Marble Ritual dishes. It glistened like a beacon of hope, emitting warmth and representing our symbol of eternal peace among nations, and planets. The Crew then gathered for the Opening Ceremony tribute. First, we processed around the Insta360 Pro behind the official flag-bearer of the Martian National Flag [Zac Trolley, Engineer] and assembled in front of the Eternal Flame. Then nation-by-nation, we processed around the Magpie, to stand as the anthem played behind the Australian, Japan, Canadian, and United States flags. All of these scenes will be overlaid during post-production and editing so that in total, the four-person crew will serve simultaneously as the official 20 person delegation from many nations. The first activity was a relay race around the arena. Each crew-member ran a leg of the race around the Magpie, and passed glowing batons between them without incident. The analogue astronauts made it through to the finals, and huddles over the Insta360 Pro to review their time trials discuss tactics and mentally prepare for the finals. Their preparation paid off. There was great jubilation as Renee Garifi crossed through the yellow ribbon finish line! After earning an excellent score for her dark and expressive ribbon routine, United States’ Renee Garifi became the individual rhythmic gymnastics Mars Olympic champion with the perfect score of 10:10. Another memorable performance, Zac Trolley of Canada delivered a mesmerizing routine incorporating more dance elements than artistic floor exercise, only to botch the final ribbon toss, and fall to the ground gasping for air. He was quickly attended by officials and given oxygen on site. Later his coaches explained that he is fully recovered and was keen to defend his reigning title. Given the altered gravity and range of climatic conditions on Mars, the Official Interplanetary Olympic Committee decided to include a long jump in both Mars Winter and Summer athletics. The men’s long jump has been included in Earth’s Olympic athletics since the first Summer Olympics in 1896. The women’s long jump was introduced over fifty years later in 1948 and was the second Olympic jumping event for women after the high jump, which was added in 1928. On Mars, there is no gender divide. With a pressure-packed jump, Dr. Sarah Jane Pell representing Australia was the first to make the leap across the red regolith, and she made it straight to the finals. She ended up with the Silver medal on her penultimate jump with a mark of18.37 meters. At the end of a great day at the Marble Ritual arena, all medal winners stood on the podium to a jubilant crowd, their hearts on their chests as the national anthem played in the afternoon sun. While Astrophysicist Neil deGrasse Tyson tweeted up a storm in 2012 by asking his followers, "How about a Mars Olympics?, we celebrate the human spirit with our speculative fiction for a future Mars Olympiad, with the dual purpose of exploring the range of movement and performance expression with the MDRS life support suits in this analogue terrain. 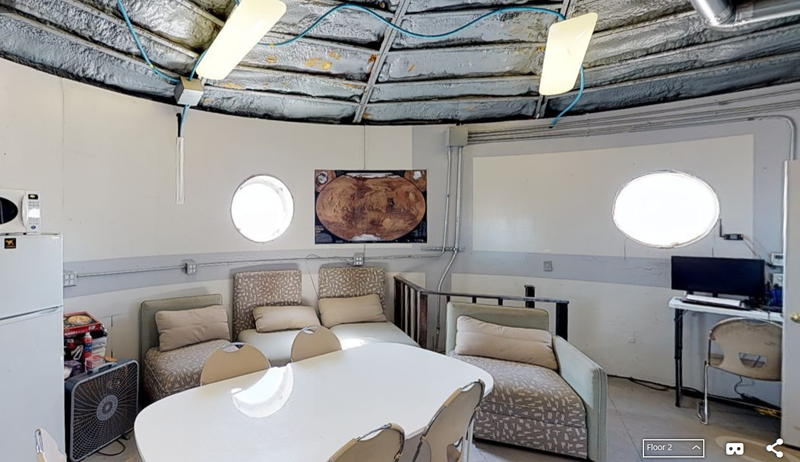 By today’s technological and biological standards, all athletes would be suffocated by the Martian atmosphere and frozen by the extreme temperatures, however, the MDRS EVA-12 helped us fashion a sense of play and performance experimentation based on coming together to work collectively in the spirit of exploration. 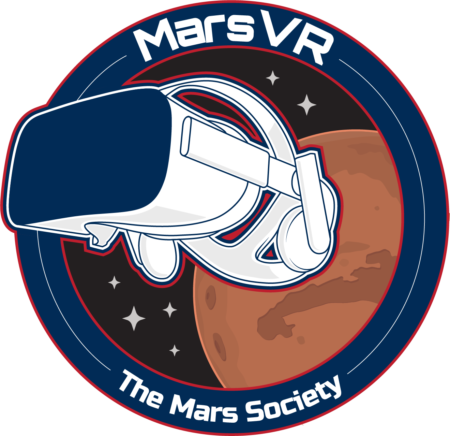 It also provided a springboard for connecting audiences with the VR outreach opportunity to explore how they might fare with 38% of gravity. Perhaps we would finally crack the code to human flight. Until then, Crew 188 send our very best wishes to all the nations of planet Earth coming together in peaceful competition for Earth’s 2018 international Winter Olympic Games in Pyeongchang, South Korea.